I don’t know Sandy, but according to Taste of Home she took this cake on a 4 1/2 hour drive to a cake contest where it won first prize. Having made it, I can see why. 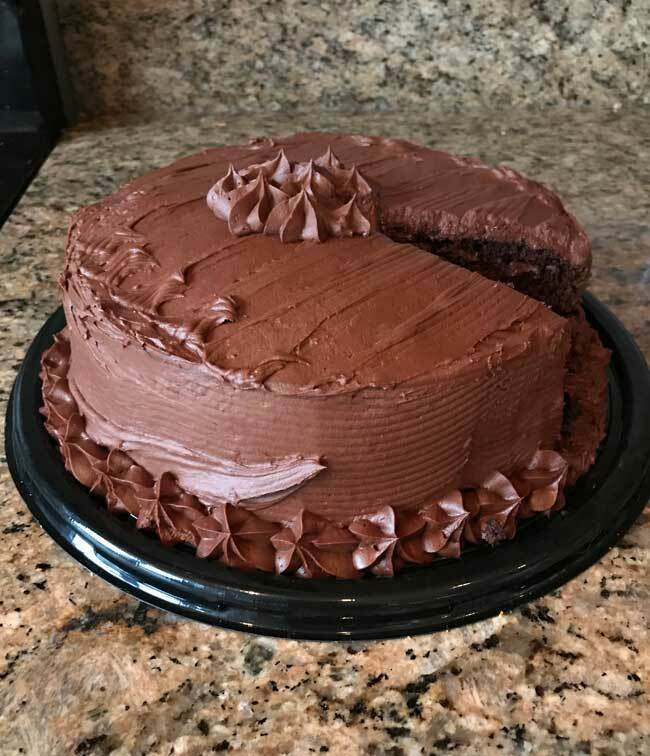 Sandy’s Chocolate Cake is a winner! This is a very fine chocolate cake with extra flavor from the brown sugar and moisture from the sour cream. It’s also a sturdy cake, which served Sandy well and maybe you too if you need to take it somewhere. As for mine, I refrigerated it the first night, then the second night I just left it under a cake dome, where it seemed to improve with age. Along with being sturdy, it’s a good make-ahead. Here’s the recipe as I made it. I didn’t stray too far from the cake recipe, but I did change the frosting completely because while I love cream cheese frosting (I actually used some leftover cream cheese frosting in the center), I like sour cream chocolate frosting better. Also, the recipe is for three layers, but if you need to scale it back you can make 3/4 of the recipe and just make two 9-inch layers. It worked perfectly for me, but next time I’ll go with the full three layer version as written below. 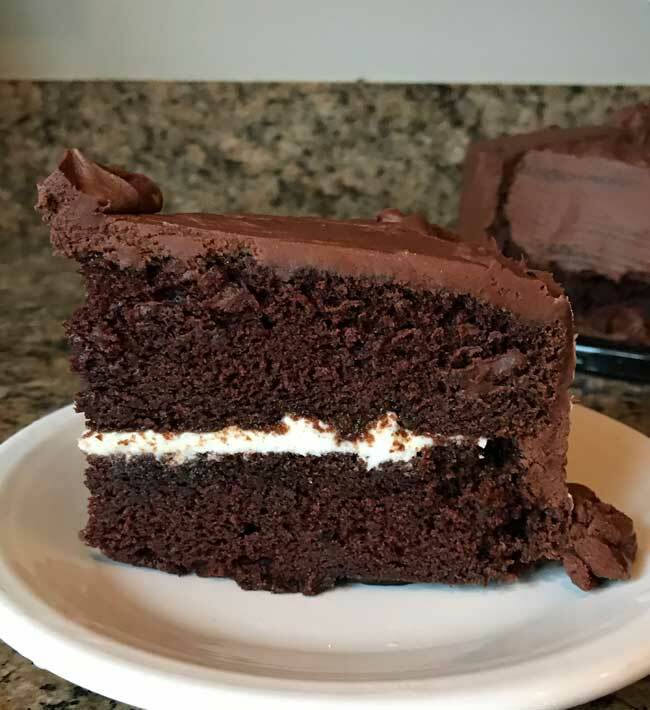 Sandy's Chocolate Cake is a rich three layer sour cream chocolate cake with a sour cream frosting. Preheat oven to 350°. Grease three 9 inch round pans and line the bottoms with parchment. Grease the parchment, then dust with flour. Note: The parchment is necessary here! The cake likes to stick. In a large bowl, whisk together flour, cocoa, baking soda and salt; set aside. In a very large mixing bowl, using an electric mixer, beat softened butter and brown sugar until light and fluffy. You can do this with a handheld mixer or a stand mixer and paddle. If you have a stand mixer, I recommend it! Add eggs, one at a time, beating well after each addition. Beat in vanilla. Add flour mixture to creamed mixture alternately with sour cream, beating well after each addition. Stir in hot coffee until blended. Beat with the mixer for about 30 seconds to remove lumps. Transfer to prepared pans. Bake until a toothpick comes out clean, about 30-35 minutes. Cool in pans 10 minutes; remove to wire racks to cool completely. To make the frosting, beat the butter and 1 cup of the sugar in a very large mixer bowl. Add ¼ cup of the sour cream, another cup of sugar and cocoa powder and stir until everything comes together. Beat with the mixer. Add vanilla, then add remaining sugar, and milk and beat until smooth. Add more milk and sour cream until you get the flavor and texture you want. Scrape bowl often. For the confectioners' sugar, use about 120 grams per cup and don't add it all at once. Taste the frosting as you go for sweetness. Also, sifting give you a smoother frosting, but if you don't have time or are not worried about a few stray lumps, you can skip it. I had some leftover cream cheese frosting I needed to use up. Chocolate is better! Okay, here’s the two layer version. It’s basically the same recipe but I used about 3/4 of everything and just divided it between two 9 inch pans. Preheat oven to 350°. Grease two 9 inch round pans and line the bottoms with parchment. Grease the parchment, then dust with flour. Note: The parchment is necessary here! The cake likes to stick. To make the frosting, beat the butter and around 1 cup of the sugar in a very large mixer bowl. Add sour cream, another cup of sugar and cocoa powder and stir until everything comes together. Beat with the mixer. Add vanilla, then add remaining sugar, and milk and beat until smooth. Add more milk and sour cream until you get the flavor and texture you want. Scrape bowl often. For the confectioners’ sugar, use about 120 grams per cup and don’t add it all at once. Taste the frosting as you go for sweetness. Also, sifting give you a smoother frosting, but if you don’t have time or are not worried about a few stray lumps, you can skip it. My (2) cake pans are 9”, however I don’t believe I’ve ever used them. They came with a bakeware set. Anyway, this cake looks delicious, as a double layer. I’d be interested in your scaled back version also. It would probably also work in a 9 x 13 pan. I don’t believe I’ve seen 6” pans. I’d love the scaled back version to make a double layer…..yum to chocolate and sour cream! Love the combination! Hi, this looks wonderful and I will wait to hear about using 8 inch pans…please post because that size works really well..
Jerry, there’s a lot of batter so there’s a lot of baking soda. It’s proportionate, so don’t worry about it having a baking soda flavor. I think baking soda is used because of the acidity of the brown sugar and sour cream. I used natural cocoa powder, which is also acidic. I suppose Dutch process would be fine, too. About the 6 inch pans, I find them really handy. If you like the process of baking cakes and don’t want to be stuck with a lot of leftovers, the 6 inch pans are worth it. The cake sounds delicious, and beautiful piping! I love my 6-inch cake pans and have probably used them more than the 9-inch, hard to believe! They’re great for single layers, mini double layer cakes, and also for trying out a recipe for the first time, or testing one element of a recipe where I don’t want a huge portion (of each variable). Plus they’re just cute and make cute little cakes 🙂 On the other hand, cake freezes well. That’s a lot of baking soda! I haven’t used the six inch cake pans because I have 4 others to serve in most cases. And need some leftovers! But aren’t they cute? Used to use 6 inch pie pans when I made a 1.5 lemon meringue pie. Two of those plus a 10 inch pie pan worked great and I could give the little ones to my Mom and sister. This looks so good! I’ll keep this in mind for the next time I need a chocolate cake. My opinion on six inch pans is I don’t own any. With just the two of us maybe I should? I generally reserve cake making for when I have more people here to eat it or for a celebration. If I want a smaller chocolate cake I make your Troy Chocolate cake. Cheryl, I’m going to try to halve this recipe and make it in two 8 inch pans. I could be wrong, but it seems like 9 inch pans are standard these days. I’m glad to hear you like the 8 inch cakes. Do you have an opinion on 6 inch cakes? I love using my 6 inch pans because it makes just the right amount of cake for a small family, but most people seem to want larger cdakes. This is the second recipe today for cake that uses 9 inch pans. What happen to using 8 inch pans? At least this cake looks thicker than the recips using three 9 inch pans. I would prefer to have your scaled back recipe.